Here’s a specs comparison between iPhone 7 vs iPhone 7 Plus vs iPhone 6s vs 6s Plus vs SE to help you make the right buying decision. As you may already know by now, Apple’s new 2016 line-up is finally with us. The iPhone 7 and iPhone 7 Plus have been widely discussed and speculated upon over the last few months, but that can all be laid to rest now that Apple has not only officially introduced the two new devices, but revealed the features and specs in detail. The iPhone 7 may now be defined as Apple’s 2016 “flagship”, and therefore the device to have, but in the interest of choice across various budgets, the Cupertino-based company is still keeping the iPhone 6s and 6s Plus, as well as the gorgeous 4-inch iPhone SE introduced earlier this year in stock. That’s a great deal of choice for iOS-loving consumers. Now that the iPhone 7 and 7 Plus are available, it means that Apple’s official literature has been updated to reflect those new introductions, which, in turn, means that we can now get a fairly decent side-by-side comparison of all of the devices available from Apple. Granted, the majority of consumers will base a purchase on the device either being the newest – and therefore presumably the best in their opinion – or by the one that fits into their smartphone budget. Very few will actually look to compare technical specification and underlying performance figures, but, presumably like those reading this, we care about that kind of stuff. The iPhone 7 series may be visually somewhat identical to its predecessor, but it has gained significant number of improvements internally that could make it an immediate choice for consumers. The A10 Fusion Quad Core CPU is accompanied by the next-generation M10 motion co-processor, which of course is a big step up from the A9/M9 combo that sits in the iPhone 6s range and the iPhone SE. Let’s have some drum roll for this one; the camera! In a complete departure from the iPhones that came before it, the 5.5-inch iPhone 7 Plus packs a dual-lens camera setup. Even the iPhone 7 now packs a larger camera sensor compared to the iPhone 6s/6s Plus and iPhone SE. The modules on the latest handsets however still come in at 12MP but 1.8 aperture, optical zoom in 7 Plus, four-LED flash, among other things means that overall camera experience in the new iPhones is a huge upgrade over the predecessors. The front-facing FaceTime HD camera has also been upgraded to 7MP compared to 5MP in predecessors. Also different with the latest iPhone is the lack of a 3.5mm headphone jack. But there’s now an addition speaker, carving up a nice little dual-speaker stereo setup for the iPhone 7 and iPhone 7 Plus as well. Other changes include a brand new force-sensitive Touch ID/Home button, IP67-rated water and dust resistance, upgraded display, and more. Apple is also offering the new iPhone 7 range in three storage capacity options, with 32GB being the new entry-level capacity and moving up to 128GB and 256GB capacities. 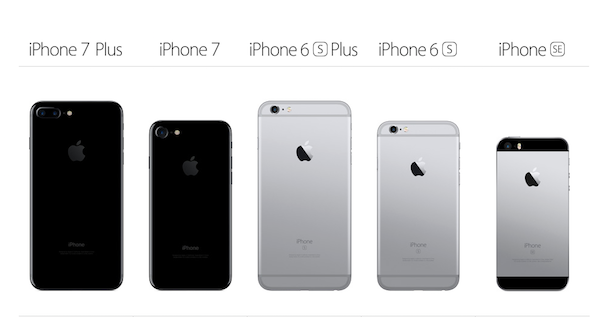 The iPhone 7 is also being offered in new color finishes, this includes Jet Black, Black, Gold, Rose Gold, and Silver. Apple has also bundled in a slightly larger battery in the iPhone 7 range compared to last year’s iPhone 6s/6s Plus to provide some additional up time. If that all sounds good to you, then you might want to compare it directly so make sure you check out the embedded comparison chart below for the real granular details. They should have improved battery life more, and the plus should be a smaller form factor. The keynote says it has two speakers now. One at the top and one at the bottom. So when you hold the phone landscape it’s in stereo. What I don’t get is how you can have a speaker at the top with no speaker holes. All the photos on Apple’s show the top of the phone with no holes. Maybe the photos on the site are just renderings that don’t show holes. It looked more like they’re using the earpiece speaker as a second speaker. Probably restricted to lower volumes while being used for phone calls without speaker phone enabled to prevent injury. Ah.. I didn’t think about that. Super Mario run more like Sackboy game for iOS it looks stupid like other games but adding the italian plumber on it ! Why don’t you just get a Note 7 then and let us know what happens when when the battery explodes on you.